Where: Spokane Civic Theatre’s Main Stage, 1020 N. Howard St. Call: (509) 325-2507 or tickets TicketsWest, (800) 325-SEAT or www.ticketswest.com. Yes, there will be a parrot. Yes, there will be swordfights. And yes, there will be a peg-legged pirate named Long John Silver. The sets – including the deck of the pirate ship Hispaniola – were designed by technical director David Baker. Director Christopher Wooley is in charge of keeping the action rolling and fight choreographer Bryan Durbin is in charge of keeping the sabers rattling. The show is billed as a family adventure and is, of course, suitable for kids. However, Mentzer said they have made a conscious effort to keep it from straying into the more-silly Disney territory. 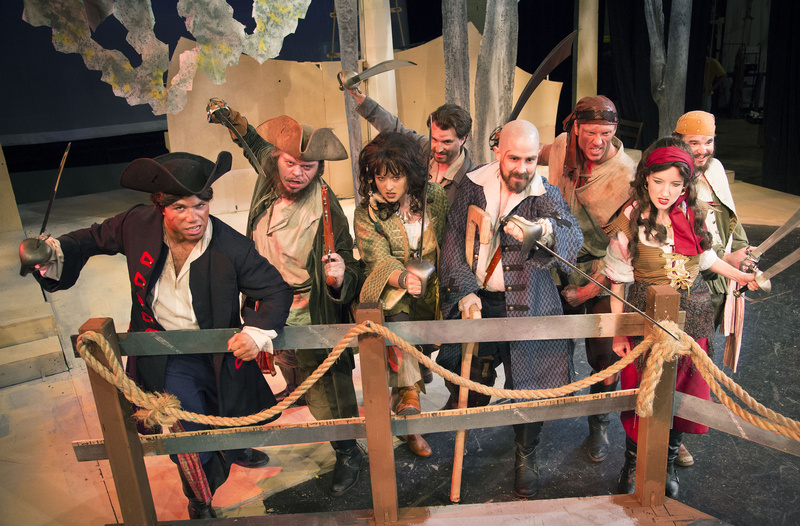 The show includes plenty of literature’s most notorious pirates, including Billy Bones, Israel Hands, Blind Pew and Anne Bonny, played, respectively, by Delvone Bullis, Evan Clements, R. Travis King and Sarah Miller. Then there’s Long John Silver himself. He befriends and becomes a father figure to young Jim Hawkins, played by Evan Lee Achten. Yet Long John Silver has his own cunning, devious and ruthless plans. Playwright Ludwig is better known for comic farces such as “Lend Me a Tenor” and “Moon Over Buffalo.” Yet Ludwig has also developed a reputation for fast-paced adaptations of classic adventure stories, including “The Three Musketeers” (which the Civic will do next season). When Ludwig’s “Treasure Island” premiered in 2007 at Houston’s Alley Theater, Variety’s critic Joe Leydon said “it could usefully serve many youngsters as an introduction to the magic of live theater.” It later went on to a successful 2008 run on London’s West End. “Some scenes are line-by-line re-creations from the book,” Mentzer said. Now, about that parrot. Mentzer doesn’t want to give away too much, so here’s an intriguing hint: A mechanical engineer had a hand in creating this character.